Pie Five Pizza Co. debuts first fast, low-carb, cauliflower pizza crust option. DALLAS, Jan. 3, 2018 /PRNewswire/ -- Pie Five Pizza Co. is making all of your New Year's dreams come true with the launch of its nutrient-rich, lower-carb cauliflower crust. 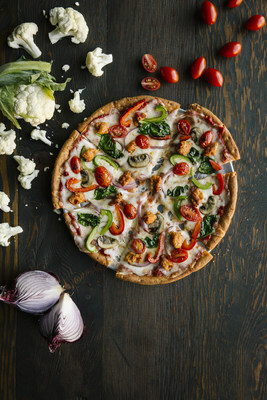 "Cauliflower is exploding in popularity due to its taste and amazing health benefits," said Christina Coy, Vice President of Marketing for Pie Five Pizza Co. "We were inspired to incorporate this versatile veggie to create a healthier crust that is still super delicious. Now, with the debut of our cauliflower crust, health conscious guests don't have to cut pizza out of their diet." Pie Five is the first fast casual pizza concept to introduce a cauliflower pizza crust to its dough line-up. The new cauliflower crust is gluten-free with only 40 net carbs. That's less than half of the net carbs in any other Pie Five crust. The specialty crust also has less than half of the sodium found in other crusts and may be the best crust option for those with diabetes. Load some fresh veggies onto the customizable pizza and you're all set! Cauliflower is rich in Vitamin C, Vitamin K, health-promoted phytochemicals and anti-inflammatory compounds. It is also an excellent source of natural antioxidants and helps improve digestion and detoxification. The new crust will be added to Pie Five's three existing made-from-scratch crust options – crispy artisan thin, classic pan, traditional Italian along with gluten-free. The cauliflower crust will only be available through Feb. 11, so be sure to customize your pizza using this healthy delight before it's too late. The new cauliflower crust, along with wings, sandwiches, delivery and online ordering initiatives are all part of the Pie Five concept refinement process driven by Rave Restaurant Group, Inc. CEO Scott Crane. Crane recently introduced a new Pie Five prototype that includes a revamped interior, logo and menu in Plano, Texas. The next-generation design also offers craft beer on tap. Pie Five's fast-casual concept provides guests with a fully customizable experience from start to finish. With more than 40 fresh toppings, seven savory sauces and multiple made-from-scratch crusts, there's a delicious pairing to match every guest's preference. Pie Five also accommodates dietary restrictions by offering gluten-free crust and vegan cheese options. Complement each pizza with a freshly tossed salad or warm cinnamon stix dessert. Dallas-based Pie Five Pizza Co. is a subsidiary of Rave Restaurant Group, Inc. (NASDAQ: RAVE). Rave owns, franchises and supplies more than 300 Pie Five and Pizza Inn restaurants operating domestically and internationally. Pie Five Pizza Co. is the leading brand in the rapidly growing fast casual pizza space, offering individual handcrafted pizzas with fresh ingredients made to order in less than five minutes. The brand was named among Fast Casual's Top "Movers & Shakers" for three consecutive years, 2015 "Best Franchise Deal" by QSR Magazine, 2012 Hot Concepts winner by Nation's Restaurant News and one of "10 Hot New Restaurant Chains from Established Brands" by Forbes.com. For more information, please visit PieFivePizza.com. SOURCE Pie Five Pizza Co.